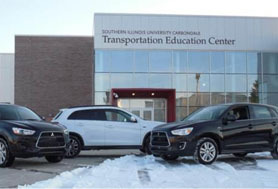 Mitsubishi Motors North America (MMNA) recently amplified its support to the SIU Automotive Technology Department with the donation of 3 new Mitsubishi Outlander Sport vehicles, 5 Constant Variable Transmissions, and 2 engines. The donation valued at over $100,000 is intended to help further the mission of the Department to continue developing the industry’s future leaders. As the nation’s premier automotive program, SIU Automotive Technology utilizes a competitive admissions process for student selection due to the extremely large demand. MMNA is committed to supporting the program’s proud legacy of developing graduates that help lead many of the world’s largest corporations. SIU Automotive graduates hold numerous executive positions with Mitsubishi and are responsible for providing this donation. SIU Automotive graduates truly display “Once a Saluki – Always a Saluki!” Congratulations!